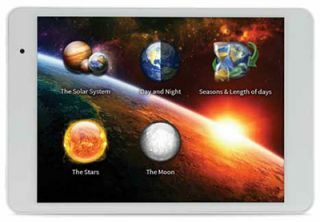 The LearnPad Octavo Solution is a 7.85” tablet with 4:3 aspect ratio. It comes paired with ClassConnect, a learning management dashboard that is an easy and simple solution for managing tablets in the classroom. The tablet is lightweight and easy to transport. ClassConnect allows teachers to easily set up and control tablets from a central Web page. The LearnPad Octavo comes standard with ClassConnect and implementation help is also included from LearnPad. Schools have access to an implementation specialist who will work with the IT department to set up the LearnPads and provide the teachers with a Webinar overview of the product. Schools may also opt to purchase the Instructional Coaching Program, which brings a coach to the school for two days of training and provides individualized coaching to teachers in their classrooms. Quality and Effectiveness: ClassConnect offers teachers a central dashboard from which they can control an entire classroom set of devices. From choosing the apps to install on the tablets to collecting student work to monitoring student activity, teachers maintain control over the tablets at all times. There is pre-created content available on ClassConnect, and teachers can create their own materials. Lessons consist of up to six categories, and each category can contain multiple resources, including apps, files, and Web links. ClassConnect offers over 200 lessons aligned to Common Core standards in ELA, science, social studies, and math for K-8, many consisting of all free resources. The Octavo is a small tablet computer that comes with a still and video camera, making it easy to transport for mobile learning activities with students. With the standard app packs installed, students can easily produce work on the tablets, including typed documents, photo collages, and more. Ease of Use: ClassConnect, the management portion of the solution, is simple to set up. Students can be added individually or via LDAP or Active Directory. The Octavo is easy for all students to navigate because the content for the device is controlled by the teacher. • Classroom Management: Teachers can use the LearnPad Octavo to monitor and control what students are doing on the tablets in real time. • Differentiated Instruction: Teachers can use the LearnPad Octavo to push different lessons to individual students in real time. • Multiple User Device: Multiple individuals can utilize the same device by logging into their own documents without making changes to other users’ settings. OVERALL RATING: The LearnPad Octavo Solution is an easy answer to the question of how to effectively manage classroom sets of devices. ClassConnect is a powerful management tool that helps teachers and students stay focused on the lessons being delivered and for teachers to keep an eye on what is happening on tablets throughout the room. The Octavo tablet is a lightweight, fully functional, 7.85” tablet with all of the ports and tools necessary to make it easily integrated into the classroom.